breakpoints by long-range polymerase chain reaction (PCR) using genomic DNA proved inconclusive. Hybrids monosomal for chromosome 2 were then created using lymphocytes from the mother of the proband to directly examine each allele of MSH2. Southern blots were repeated, and although one allele of MSH2 from the donor demonstrated the wild-type hybridization pattern (Fig. 3A, lane 4) also seen in normal controls (Fig. 3A, lane 1), the second MSH2 allele (Fig. 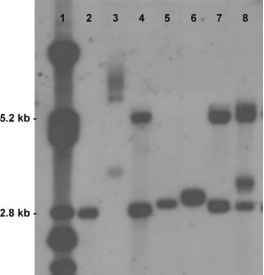 3A, lane 3) presented the same new fragment of approximately 11 kb as seen in the genomic DNA from the proband (Fig. 3A, lane 2). MSH2 exon-specific PCR reactions for exons 1 and 3 (Fig. 3B) and exons 2 and 3 (Fig. 3C) showed that the allele with the altered hybridization pattern failed to amplify at exons 1 and 2 (Fig. 3B and C, lane 2), whereas the allele with the wild-type pattern amplified at both exons (Fig. 3B and C, lane 3). With the further identification of the deletion breakpoints, carrier testing could then be conducted on siblings of the proband to determine their relative risk for tumor development. The literature contains a number of other case reports where monosomal cell hybrids were utilized as successful templates for traditional mutation detection techniques. Hybrids have also been used to identify deletions and splice site alterations in mismatch repair genes by use of PCR, reverse transcription (RT) PCR, and direct sequencing in two series of HNPCC patients in which conventional mutation detection techniques had failed using genomic DNA. [3'4] Similar methodologies were also used to confirm homozygosity for a single nucleotide substitution in the CSA gene in a patient with autosomal recessive Cockayne syndrome. Hybrids have been used in cytogenetic cases to identify the translocation breakpoints in a patient with multiple myeloma using chromosome painting and the parent of origin for a Robertsonian translocation involving chromosome 21 in an individual with Down syndrome by fluorescence in situ hybridization. Finally, monosomal hybrids were used to demonstrate the presence of two SMN1 copies on one chromosome in a carrier of autosomal recessive proximal spinal muscular atrophy (SMA). Molecular diagnosis of SMA carriers is typically performed through a quantitative PCR assay for SMN1 copy number, and an individual with two SMN1 copies on one chromosome and none on the second chromosome would appear normal by the dosage assay but would be a carrier in reality.